GIS Day celebrates geographic information system technology and the quest to use geography to understand our world. Break out the maps, apps, and globe cakes. 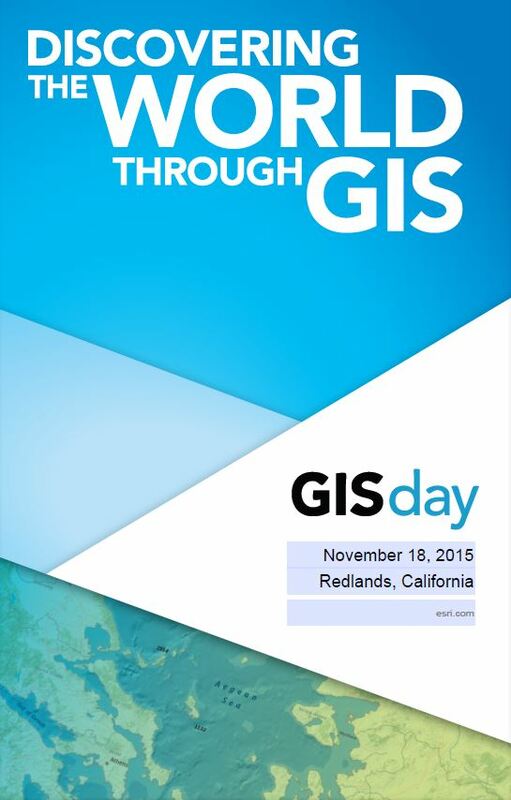 November 18 is GIS Day, a showcase for the technology that applies geographic science to decision making. It’s also a celebration of what organizations that use GIS do throughout the year, oftentimes unseen by the public until GIS Day rolls around. “This is a chance for you to tell others about the value of your work and the meaning of maps and their power,” said Esri president Jack Dangermond. 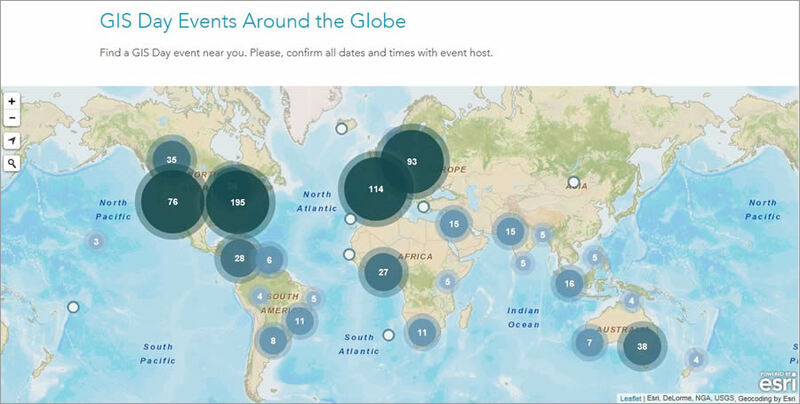 More than 1,600 GIS Day events will be held at schools and organizations around the world, including in Samoa, South Africa, Brazil, Colombia, China, Mongolia, Pakistan, India, Lithuania, Ukraine, Poland, Great Britain, France, Germany, Turkey, Australia, Canada, and the United States. Some programs will be geared toward children, including Ashcloud Apocalypse, billed as the biggest student mapping event of the year in the United Kingdom. The GIS project was conceived by Raphael Heath, head of geography at The Royal High School, Bath and supported by Esri UK and the Girls Day School Trust. The project’s premise is that if one of the world’s mega volcanos erupts, how would the area you live in be affected, based on your distance from the disaster? Students will map risks based on weather data (temperatures in some areas would plummet due to ash in the atmosphere) and traffic data (road conditions would likely be chaotic near the eruption). The GIS Day website includes the sites of the Ashcloud Apocalypse events, many of which are in the United Kingdom and Singapore. The City of Dubuque, Iowa, will host a GIS app hackathon. Other events are aimed at adults, including the Think Outside the Map program, hosted by the City of Brooklyn Park, Minnesota, on GIS Day. The city, which won a 2015 Special Achievement in GIS Award at the Esri User Conference, will show off its citizen-oriented mapping apps, including a story map tour of the most beautiful gardens in the city and a time animation of traffic accidents in Brooklyn Park over the last five years. And in Hyderabad, India, Geosys Enterprise Solutions Pvt. Ltd. will host a conference that will include talks on developing web apps using Web AppBuilder for ArcGIS, working with ArcGIS Online, and using GIS for managing the environment and disasters. How can your organization put on interesting GIS Day events such as these? Erin Gardner runs the GIS Day program at Esri. When she’s asked by an organization for GIS Day ideas, she asks its staff to look inward. “It’s really all about what you have a passion for, whether it’s teaching children about GIS or showing your community the cool apps you’ve developed to better manage your city and make it a better place to live,” she said. Register your event on this map at GISday.com. “I think part of making GIS Day fun is making your maps and apps relevant and interactive (for attendees)—places they can relate to and something they can touch and see,” Gardner said, citing maps of local parks or urban gardens as examples. Proudly show your work. Let people see the fruits of your labor. Show your GIS Day visitors those web or mobile mapping applications you developed this year, for example, crime and transportation maps or biking and hiking apps. GIS users in Iowa will get their creative juices flowing when the City of Dubuque hosts a GIS application hackathon on GIS Day. Educate people of all ages about maps and GIS. Introduce the community to the power of geographic thinking. Everyone from toddlers to senior citizens are invited to celebrate GIS Day at the library in Boulder City, Nevada, at an event hosted by the US Bureau of Land Reclamation. Guests can watch an interactive demonstration of GIS technology and tour a gallery filled with maps made by GIS professionals. They can also take a geography quiz and participate in an orienteering activity. GISday.com offers resources like this downloadable template of a poster that you can customize with the date and location of your GIS Day event. Let them make maps. A high school in Kozienice, Poland will let junior and senior high school students do that using Esri ArcGIS Online. Esri staff will use ArcGIS Explorer Desktop to give Where in the World Are You? demonstrations at schools in Inland Southern California cities including Pomona, Covina, and Alhambra. Students will see how to visualize places using GIS. Tell stories with maps. Teach story map making using the collection of apps available on the Story Maps website. You will find step-by-step builders for Story Map Tour, Story Map Journal, Story Map Swipe, and many others. All you need is an ArcGIS Online account. Informi GIS, the distributor of Esri technology in Denmark, will teach adults how to create and share story maps in Charlottenlund, Denmark, on GIS Day. Register your event at GISday.com. Fill out this registration form and include the name, description, time, and date of your event. That information will be uploaded to the GIS Daywebsite map. Why register? It’s great publicity! Many people today get their news and information from the web. Give away GIS Day swag. Visitors will love you for it—who doesn’t like a little something for free? Hand out GIS Explorer pins, notebooks, pencil sets, temporary tattoos, water bottles, or other promotional items if it’s within your budget. The Esri store stocks these items, along with GIS Day polo shirts. Earth cakes are a popular GIS Day treat. Follow GIS Day on Facebook, Twitter, andGeoNet. Keep up on the latest GIS Day news from Esri and GIS users. 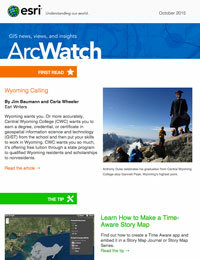 You can mine the sites for GIS Day tips and read articles about geography and mapping. Imitation is the sincerest form of flattery. So read the posts from your peers from all corners of the world to learn about the unique ways they celebrate. Exchange ideas too! Tap into resources from the GIS Day website.Esri provides templates for promoting and supporting your event, including postcards, posters, PowerPoint presentations, and videos, along with more than a dozen hands-on exercises and activities for children, teenagers, and adults. Download files on how to host a geocaching game, how to use GIS to create a special habitat for lynx, and how to use Esri ArcGIS to explore Mars.Access the resources. 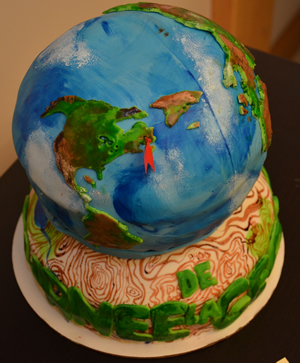 Bake a GIS Day cake or another type of yummy geo treat. Last but not least, there’s no better way to attract a crowd to GIS Day than with freshly baked cakes, cookies, and cupcakes shaped like globes or decorated with map designs. Scrumptious geographic confections over the years have included some real originals, including an edible computer mapping cake baked by the staff at University of Kentucky Facilities Management. Need more inspiration? Watch this video from Nerdy Nummies to get the recipe and instructions for making and baking a layered earth cake.